Have a good story? Contact us! In recent years, there has been a stream of press reports about the involvement of people close to Árpád Habony, Hungarian prime minister Viktor Orbán’s top advisor, in Hungary’s controversial golden visa scheme. The articles often pointed to Shabtai Michaeli, an Israeli-Georgian businessman who is known to have ties to Habony, and the law firm of Kristóf Kosik, who had been the advisors’ legal representative. These reports were often based on circumstantial evidence, but now confidential documents obtained by Direkt36 provide a more direct proof of Shabtai’s and Kosik’s involvement in the scheme known as the residency bond program. E-mails and other internal files show that Shabtai took part in the operations of VolDan, the company that was authorized to sell the so-called residency bonds in Russia and in some Post-Soviet states. Another document shows that Kosik’s law firm handled the case of a residency bond buyer. Shabtai Michaeli told Direkt36 on the phone that he “had nothing to do with the matter”. When asked about the documents concerning him, he said that he does not even want to hear our questions, then he threatened to launch legal proceedings. Árpád Habony, Kristóf Kosik and the company VolDan did not respond to questions sent to them. The law creating the Hungarian residency bond program, initiated by Antal Rogán, a powerful politician of the governing Fidesz party and Árpád Habony’s long-time ally, was rushed through Parliament without substantial debate in 2012 and quickly became one of the most controversial initiatives of the Fidesz government. Under the scheme, those who invested 250-300 thousand euros in Hungarian state bonds were granted a Hungarian residence permit. We can only do this work if we have supporters. Become a supporting member now! Hungary’s program differed from the Golden Visa schemes of most other countries, as here applicants could get their money back: the investment was placed in a special government bond that would fully repay the amount after five years. The most heavily criticized aspect of the program was that foreigners did not invest in the residency government bonds directly but did so through designated intermediary companies with opaque ownership structures, handpicked by the Economic Committee of the Hungarian Parliament, led by Rogán Antal at the time of the program’s creation. Dealing with Hungarian residency bonds was a windfall for these companies, which charged service fees ranging between €40,000 and €60,000 per investor. VolDan Investments Limited is registered in Liechtenstein, the European mini-state, where the ownership structure of companies can remain hidden from public records. At the launch of the residency program, the Hungarian parliament’s economic committee claimed that VolDan’s managing director was a businessman from Liechtenstein, Josef Hermann, who founded the company with Walter Wachter, also from Liechtenstein. Later, however, Hungarian news reports claimed that VolDan, in fact, belongs to Shabtai Michaeli, a businessman with ties to Árpád Habony. News articles pointed out that Habony had a close relationship with the Georgian-Israeli business circle, which operates a bakery chain called Princess. Michael Gagel, one of the chain’s managers, appeared in several photos together with Árpád Habony. Gagel’s business partner, Shabtai Michaeli was recorded leaving a building where the office of Balázs Kertész, a lawyer close to Antal Rogán, is operating. Habony was also seen entering and leaving the building several times. Michaeli was also recorded as he was discussing a high-value business deal with former Georgian politicians in front of the building, the news site Index reported in 2016. In March 2016, the weekly magazine Heti Válasz reported that VolDan “uses the infrastructure and the people of the Gagel-Michaeli business circle for the residency bond business”. 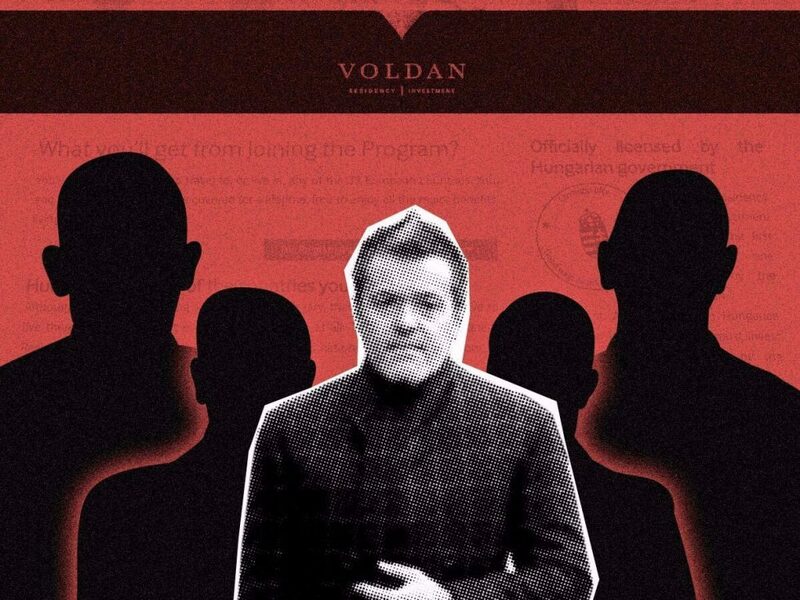 The magazine based this claim on connections between the executives of VolDan and Shabtai and his partners. A few months later, the news site 444 published an article citing a contract template of VolDan that was found on the internet. According to the template, Shabtai was VolDan’s authorized representative. Both Shabtai and Gagel denied that they were connected to VolDan but they lost their lawsuits challenging the news reports. The documents obtained by Direkt36 directly prove that Shabtai Michaeli took part in VolDan’s operations. An invoice issued for one of the company’s clients, a residency bond buyer, bears the stamp of VolDan Investment Limited along with the name and signature of Michaeli. A source familiar with VolDan’s operations said that the company frequently used Michaeli’s signature stamp for authenticating documents. A leaked e-mail also pointed to Michaeli’s role in VolDan. His personal gmail address was cc-d to a letter sent to a VolDan employee. It’s the same email Michaeli used as contact detail for at least two of his companies. Direkt36 decided not to publish the documents in order to protect the source. There is a risk that the exact content and form of the files would make it possible to identify their source. The residency bond business proved to be lucrative not only for the companies selling the bonds but also for the law firm of Kristóf Kosik, who has represented Antal Rogán and Árpád Habony in various legal cases. According to previous news reports, the residency bond sellers often hired Kosik’s law firm to handle the administrative side of the business. The documents obtained by Direkt36 also prove the law firm’s involvement in the program. According to one file, an employee of Kosik’s firm sent an email to Voldan, requesting certain documents regarding a bond purchase. Between 2013 and 2017, when the program was suspended, Hungary handed out nearly 20,000 permanent residence permits for residency bond investors and their family members. While Chinese predominate, permits were also issued to hundreds of Russians and dozens of immigrants from the Middle East and Africa. As Direkt36 and its partners (Hungarian news site 444 and Russian newspaper Novaya Gazeta) reported in September, some of the Russian buyers were members of Russia’s ruling elite, including the son of the Russian foreign intelligence. According to the Hungarian Immigration Office, 384 Russian citizens bought residency bonds through the program. As the family members of investors could also apply for residence permit, a total of 1265 Russian citizens received Hungarian papers in the program. VolDan charged a fee of 60 thousand euros per investor, which resulted in over 23 million euros of income for the company. We used a photo by István Huszti (Index.hu) for illustration. For the Hungarian company data we used the services of Opten.